Just a quick announcement to let everyone know, the website that used to host the Time’s Up! / A Matter of Scale is officially no more. The pages are still there if you have the full links, but it’s got too old and clunky to update or even keep maintained, so everything I could move has been moved, and all links have been tested and updated where necessary, so it’s all tickety-boo. I’m sorry I could not migrate the full text of the book, but that would have meant adding a huge sub-menu and checking literally hundreds of links. Hope you enjoy visiting, and re-visiting the book. Catharsis. That’s the reason a lot of people write, and some days it does seem like I’m writing to rid myself of whatever is trapped inside my head. I’ve had a pretty good life; no one could deny that, at least in the context of being brought up a part of industrial civilisation, but I’m deeply worried. Again. Some time in July 2015, there was a break in the weather for a day. This was the third time we had travelled to the Western Isles of Scotland in three years – the two previous years had been idyllic in terms of weather, location, being together as a family and taking the chance to connect with what I consider my “spiritual home” if there is such a thing. The most recent time was different, mainly because the weather was dreadful, but we did our best to keep spirits up, and did have a good laugh in the face of adversity; and when the sun came out, it seemed like this really was the best life could be. The photograph doesn’t show that there were two of us sitting above the beach – the feet aren’t mine – but no image could capture the sense of that moment, that deep connection between two people and the place they are. Weather and, now it becomes clearer, climate is playing on my thoughts again. Storm after storm is hitting Britain: the UK Met Office have given them names so we take the warnings more seriously, and so far communities are just about coping where they have been worst hit. This is not normal, though, and I’m sure the Met Office are more than aware of the added significance in giving Atlantic storms tropical nomenclature. We are going to have to get used to a climate that has begun to change rapidly. The words of Guy McPherson ring in my head: “We’re fucked” is the gist, but more than this is a sense that we’re possibly over as a species, and definitely as a culture. It seems that civilisation has thrown everything it can at the ecosystem, and still shows no signs of stopping, despite the ragged mess that lies in front of the weapons of death. I try not to worry, so I write. In that process comes an element of calm, putting what I can into the novels that are otherwise feeding out from somewhere deep inside my head, so the fears are threaded into a background tapestry, not so vividly that the reader will be scared, but clear enough that perhaps some readers will take from them the same theme I have tried to pursue for many years: we meddle with things at our peril, and need to realise what really matters to us. Buried in the pages of Underminers are the words of many others, all of whom I respect and consider to be Underminers in their own special way. From the very beginning, the book was meant to be a collaborative effort – something that somehow got lost when it went to print and which I have been remiss in not highlighting on the pages of this website. Now it changes; these wonderful people gave permission for their words to be re-printed and edited, and some even wrote especially for the book. You can read more by going to the special page devoted to these essays, complete with anchor links directly to their words. Click HERE for the page, or follow the link at the top. Here’s a picture of a pile of A4 paper, printed in double-space, double-sided, 11 point text. An agent wouldn’t like that, but it’s okay because the manuscript in the photo is just so a few people can read through it and tell me what they think of my first novel. I have a different version for potential agents, in 12 point text, because they prefer it. 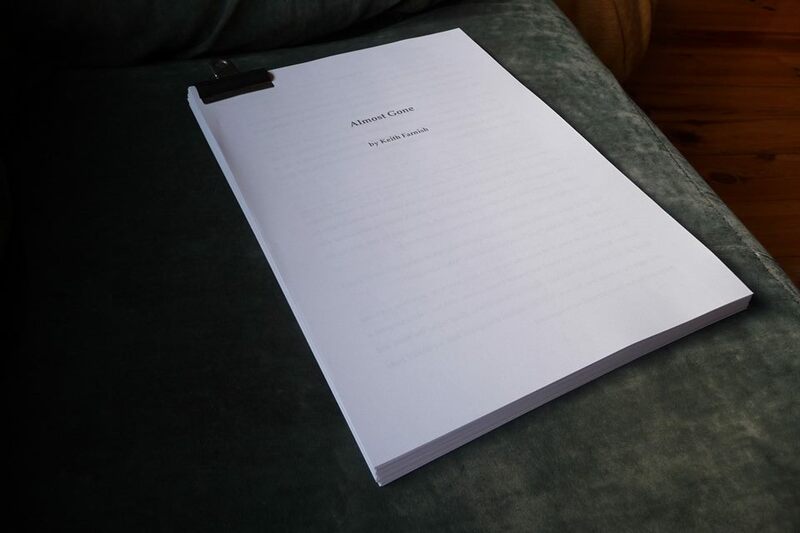 I actually finished writing the first draft of “Almost Gone” (probably not the final title, there is another book of that name) on 27th February. I felt slightly whoozy after typing “THE END”, excited and a little lost. What do I do know? Ultimately, the answer is to get it published and go out on lots of book signings, get asked questions and give the kind of answers that make more people want to buy the book. The publisher might want a follow-up too. That’s not impossible. For all this pipe dreaming, there is a serious point. If I have to make money, I would rather do it doing something I love than something I am merely good at. The bit of money, or barter, I make is currently through fixing computers. I hate computers, they have various functions but they are inhuman and disconnect people, so I feel like a hypocrite, although I do spend a bit of time chatting to people, like a good doctor, and listening to their stories – people seem to feel the need to tell me things, and that’s fine. The question is, am I as good at writing as I am at fixing computers? The answer will probably – with a bit of chance thrown in – determine whether (a) I can find an agent willing to represent me, (b) whether a publisher will want to invest in my work, and (c) whether people will want to buy it. And, yes, I will do everything in my power to make it free online. So I am doing a lot more writing – in the form of introductory letters, plot synopses and personal statements; sending these off to agents on spec, and then waiting. If anyone can help make this process any quicker and more rewarding. i.e. if you know a good agent (or are a good agent) who is willing to represent me, then I would love to hear from you, via this link. I’m sweating. It’s just the hill and the pools of warm sunlight. A sheen of moisture on my arms and beads of sweat in my eyes force me to stop and consider things. Flies settle on my eyelids, emerging from the damp ground in the dip where I decide not to rest. The sound of running water further up declares a spring, and fresh drink. As I lie, with my fingertips playing in the rivulets, my lips cool again, I wonder how I’m going to find what I’m searching for…and drift away on an amber blanket of beech litter. Merod sits atop a pile of leaves, calling my name in a song that evokes the wind and the birth of spring in luminous green. As she sings her legs are gently swallowed by the leaves which seem to crawl upwards, caressing her waist, her sides, her shoulders until only her smiling face remains, opening into a black chasm and howling the moan of ripping roots…and the slow, deep rumble of the earth wakes me, gasping. My face is running with perspiration and the rumble goes on, vibrating through the ground and my gut. So much louder than before. I stumble upright, shaking on weak legs, turning to try and locate the Sound’s source, but it defies direction. All I know is I’m closer. A natural clearing lies ahead, caused by a pair of huge beeches recently fallen and taking smaller kin with them. In the midday sun a cacophony of birdsong plays on the air, partners in the making, eggs to be laid and hatchlings to be born. The reason for the falling is clear – shallow roots into a rocky ground that have been loosened by torrents of rain. What remains is a pool, yet to be colonised and maybe ephemeral. I stand at the edge of the pool, with the sun right above. I briefly catch my reflection and turn away. This isn’t me, surely. Calming myself, I take in the second look and see a mass of tangled hair full of sticky pine needles and dead bugs, a face dirty with boy-grime, and a yawning red hole, unpeeled and leaking. The edges of the wound have taken on a rosy tinge and specks of black and brown occupy the space between. We know about germs; we’d be dead soon enough if we didn’t. As a small boy I could pee just about wherever I liked, but if it was anything else then there were special places, away from the water supply, away from the crops. Soap is a precious thing, but that’s one time we always use it. But even then you never know when someone will break out or fever, or worse – well, we do know, sort of, and I am staring at one of those times out of the pool and back at my own stupid face.